There were more defensive issues, plenty of mild panic and another “fine line” moment, but FC Bayern München were far too good for a brave Schalke 04 at the Allianz Arena. Following Borussia Dortmund’s staggering meltdown against Hoffenheim, the gap at the top has been shaved back to five points. 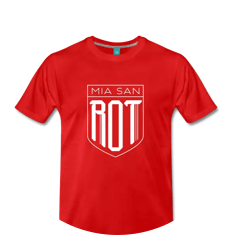 Are things starting to turn for Die Roten? In my three takeaways from the DFB-Pokal win against Hertha BSC in midweek, I suggested that I am starting to sound like a broken record. Here’s the drill: Bayern start well, dominate proceedings, look shaky at the back, and just about do enough. Against a wobbly-looking Schalke 04, the Bavarians should have been home and hosed by half-time. Instead, it was a lot closer than it should have been. An own goal from Jeffrey Bruma put the home side in front, but Niko Kovač’s men were unable to turn their dominance into goals. Cue a break at the other end, and teenager Ahmed Kutucu leaving a struggling Jérôme Boateng in his wake before finding the back of the net. Thankfully, Domenico Tedesco’s side were given no time to build on that. Serge Gnabry’s alertness set up an immediate response from the home side, and Robert Lewandowski’s 100th goal at the Allianz was both clinical and emphatic. The chances continued to come for Die Roten, but as in midweek’s cup tie in Berlin, their opponents would always have a sniff. A chaotic scramble in the Bayern penalty area saw the ball crash off the base of the post, before a firm header from Bruma crashed against the aluminium. It was yet another “fine line” moment. Despite being played off the park at times, Schalke would have felt slightly aggrieved that the scores were not level. The frustration was visible on the Bayern bench, and there must have been plenty of sighs of relief when the excellent Gnabry steered a calm header past Ralf Fährmann. Having established a two-goal cushion, it was pretty calm from thereon in. There was one bad miss from Lewandowski, but thankfully it was something we did not have to worry about. While many were handing out the man of the match awards to James Rodríguez, it is worth noting that Serge Gnabry put in another excellent shift. James did a fantastic job pulling the strings in the middle of the pitch and was Bayern’s most dangerous creative outlet, but Gnabry impressed with his tenacity and work rate. It was the young German international who engineered the second goal, winning the ball in midfield before James provided the assist. His match-clinching goal was superbly taken, keeping his head while all those around him were losing theirs. We all know that Gnabry can score goals, but less highlighted is his professional team ethic and fighting qualities. He was willing to chase down blue shirts at the back, and his determination in winning a corner was just the sort of thing we all want to see. Add to this a complete lack of petulance, even when facing some crunching tackles. Yes, I am a fan.